by condensation with carbocyclic or heterocyclic rings in combination with one or more of the foregoing alterations or not. Preparation of steroids including purification, separation, stabilisation or use of additives unless provided for elsewhere, as specified below. the resultant product is a compound under the subclass definition. In class C07, in the absence of an indication to the contrary, a compound is classified in the last appropriate place, i.e. in the last appropriate subclass. For example cyclopenta [a] hydrophenantrenes are classified in subclass C07J as steroids and not in subclasses C07C or C07D as carbocyclic or heterocyclic compounds. Subclass A01N: Preservation of bodies of humans or animals or plants or parts thereof; biocides, e.g. as disinfectants, as pesticides, as herbicides; pest repellants or attractants; plant growth regulators. Subclass A61K: Preparations for medical, dental or toilet purposes. When a steroid forms a salt, an adduct or a complex with another organic compound, classification is also made in the entry in class C07 for this organic compound. Biocidal, pest repellant, pest attractant or plant growth regulatory activity of compounds or preparations is further classified in subclass A01P. Therapeutic activity of chemical compounds or medicinal preparations is further classified in subclass A61P (as secondary classification). Cosmetic activity of compounds is further classified in subclass A61Q. In this subclass, in the absence of an indication to the contrary (e.g., C07J 5/00 and C07J 7/00), a compound is classified in the last appropriate place. Salts of steroids are classified in the groups for these steroids. Metal chelates containing steroids are dealt with in the same way. Compound in which a cyclopenta[a]hydrophenanthrene skeleton is modified by expansion of rings A, B, C or D correspondingly by one atom (the prefix "homo" may also mean that one methyl or methylene group is added in certain position, e.g. 18-homosteroids). Compound in which a cyclopenta[a]hydrophenanthrene skeleton is modified by expansion of rings A, B, C or D correspondingly by two atoms. Compound in which a cyclopenta[a]hydrophenanthrene skeleton is modified by contraction of rings A, B, C or D correspondingly by one atom (the prefix "nor" may also mean that one methyl group in certain position is substituted by hydrogen atom, e.g. 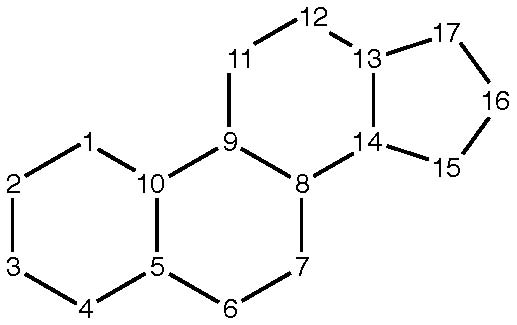 19-norsteroids, or one methylene group among non-ring members in certain position is absent). compound in which a cyclopenta[a]hydrophenanthrene skeleton is modified by contraction of rings A, B, C or D correspondingly by two atoms. relates to stereoisomers and designates atoms or groups of atoms that are arranged below the plane of a ring system (the bond between such atoms or groups of atoms and a ring system is represented by a dotted line) provided that a cyclopenta[a]hydrophenanthrene skeleton is drawn on the plane so that rings A, B, C and D are arranged from left to right. relates to stereoisomers and designates atoms or groups of atoms that are arranged above the plane of a ring system (the bond between such atoms or groups of atoms and a ring system is represented by a thick or uninterrupted line) provided that a cyclopenta[a]hydrophenanthrene skeleton is drawn on the plane so that rings A, B, C and D are arranged from left to right. Steroids having a hydroxy-group and a five-carbon-atom side-chain terminating in a carboxyl group, e.g. cholic acid. Compound containing non-modified cyclopenta[a]hydrophenanthrene skeleton. Compound which can be obtained from steroids by a break of one of the bonds in cyclopenta[a]hydrophenanthrene skeleton. Steroid alcohols; contain cyclopenta[a]hydrophenanthrene skeleton plus an 8 to 10-carbon atom side-chain and a hydroxy-group, e.g. cholesterol, ergosterol". means substitution of hydrogen atom bound to the carbon atom of the cyclopenta[a]hydrophenanthrene skeleton in that position. Compounds where the single carbon atom in position 17 beta is indirectly linked to other carbon atoms, but only via a heteroatom (e.g. where the group in position 17 beta is a carboxy ester group such as: 17 beta-CO2-Me or an amide group such as: 17 beta-C(O)NHMe). Covers compounds where the atom to which the 17-position is double bonded is a carbon atom either within the ring system of the cyclopenta[a]hydrophenanthrene skeleton or is an exocyclic carbon atom. The stereochemistry referred to is that of the chiral centres within the cyclopenta[a]hydrophenanthrene ring system. The normal steroid stereochemistry is 8β, 9α, 10β, 13β, 14α and inversion at any of these positions results in this sub-group being relevant, unless the last place rule causes a later sub-group to be relevant (e.g. a 9β-estrone is covered here, but 9β-estrone carrying an amino substituent would be covered by C07J 41/00). The stereochemistry at position 5 is not relevant in deciding whether or not a compound falls within C07J 13/00. C07J 41/0055 and C07J 41/0061 cover compounds where there are less than three carbon atoms which are not in a ring, provided that the total number of carbon atoms (in a ring or not) attached to the 17.beta.-position and not separated therefrom by any heteroatom, is at least three. C07J 43/006 does not cover steroids wherein the nitrogen-heterocyclic group is condensed to the cyclopenta[a]hydrophenanthrene skeleton sharing two or more atoms. This subgroup relates to steroid compounds containing elements other than C, H, O, S, N and halogens, in particular B, P, Si including where these heteroatoms are contained in a ring structure which is not condensed or is spiro-condensed to the steroid ring system. This subgroup also includes steroid compounds which contain chelating groups which are chelated to a metal ion. Where the element in question (e.g. P) is only present as a salt (e.g. an amino-steroid compound existing as a phosphate salt). C07J 71/0005 is the relevant symbol for spirostane derivatives. Where the steroid having heteroatoms in one of the rings of the cyclopenta[a]hydrophenanthrene skeleton is prepared by cyclisation of non-steroid starting materials see also C07J 75/005. Processes for the preparation of steroids involving the cyclisation of non-steroid compounds. C07J 75/00 is never used, in particular it is not used where the steroid is prepared but not by the cyclisation of non-steroid compounds (the process for the production of steroids not involving this method is classified in C07J 1/00 - C07J 73/00 in the same place as the compound produced). C07J 75/005 is used where the steroid compound is prepared by cyclisation of non-steroid compounds.